The Hex Par Pak includes four ADJ 5P Hex plus one American DJ Dotz Par RF Remote. The wireless remote may be used up to 75 feet / 25 meters and makes it easy for performers or lighting designers to change the color and take control of their Dotz Pars from a distance. The American DJ 5P Hex is a versatile LED Par fixture with 5 x 10-Watt, 6-IN-1 HEX LEDs. 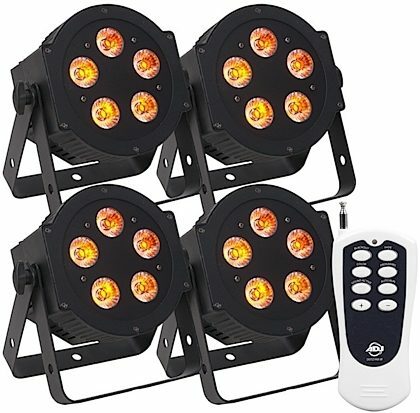 Not only is this LED Par great for lighting stages, but with its patent pending, intelligently designed, power and DMX connectors, it's great for uplighting a venue. The 5P HEX is compatible with the Dotz Par RF, easy-to-use, wireless RF remote. - BLACKOUT - Pressing this button will blackout the fixture. - FADE - This button will activate the color fade program. - COLOR - This button will activate the static color mode. Use the "+" and "-" buttons to scroll through the colors and find your desired color. - PROGRAMS - This button will activate the built-in programs mode. Use the "+" and "-" buttons to scroll through the 13 programs and find your desired program. - SOUND ACTIVE - This button activates sound active mode. - AUTO RUN - This button will run an automatic program. Use the "+" and "-" buttons to adjust the speed of the auto run.